This document in no way purports to be a full and comprehensive War History of the Regiment. It has, in fact, been built upon a series of reports on operations called for by Higher Commanders from time to time. These have been revised and edited and the whole blended into what is now claimed to be no more than an outline history of the Regiment’s background, and activities during these war years. There must, of necessity, be omissions. Many specific deeds done by various Batteries and Troops especially in the earlier days have, by virtue of the lack of records readily available, failed to find a place here. For this I make no apologies for the reason that such omissions have been unavoidable. But I do want to thank all those in Batteries and RHQ who have produced data upon which I have been able to work. Individual acknowledgements are impossible here but I should record the invaluable assistance given by Captain J.H. Green, R.A. in his general editorship and the hard work put in by the Office Staff under Sgt Rogers, K.H., the Chief Clerk, to produce this record in a well set out and legible form. It is offered as it now stands to all who take a pride in recalling the contribution which their Regiment has made to the defeat of the Nazi menace – no matter whether they have served with it throughout these years or joined after the last round was fired. It is offered also to the memory of those who have lost life or limb in making this contribution possible. Once official approval and opportunity to investigate the detailed records have been given, a final comprehensive History will, no doubt, be written. The Regiment originally existed as the 5th Battalion of the East Surrey Regiment. This was an old Territorial Infantry Battalion whose Headquarters were at Wimbledon, London, S.W. 19, with detachments at Streatham, Sutton, Walton, Epsom and Leatherhead. All the officers and other ranks were drawn from personnel whose homes were in Surrey and South West London. In November 1938 the Battalion was converted to the present Regiment which bears the full name of the 57th (East Surrey) Anti-Tank Regiment, Royal Artillery. All but a very few other ranks accepted the choice of remaining with the unit. 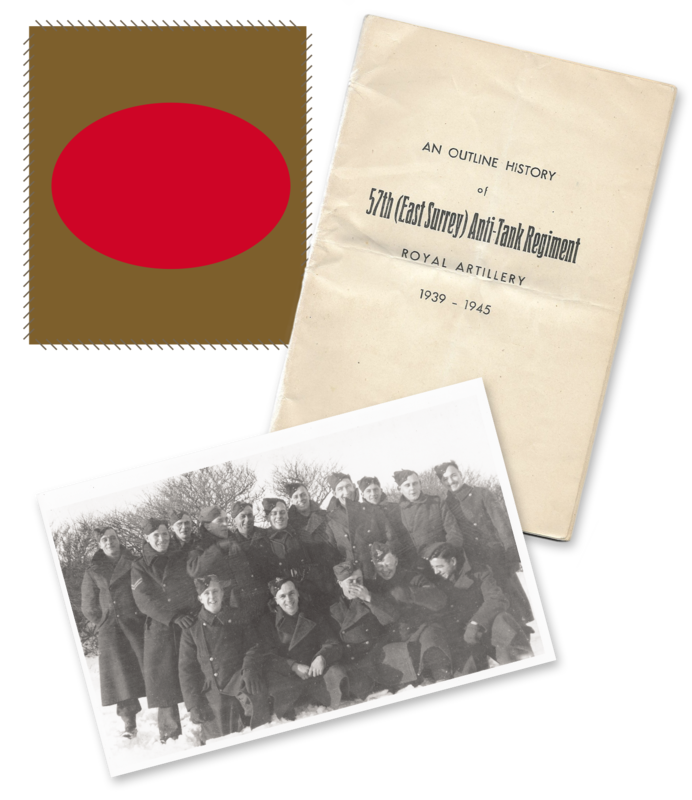 When the Territorial Army was expanded in the Spring of 1939, a second line Regiment known as the 67th Anti-Tank Regiment, R.A. was formed, partly from serving members of the 57th and partly from new recruits. The 57th is, therefore, a first line unit and, as a matter of interest, the 67th is serving with the 56th (London) Division. At the outbreak of hostilities the Regiment, which was part of the 44th (Home Counties) Division, was embodied at Epsom Grandstand and at that time was commanded by Lieut-Colonel J. Imison, M.C., R.A. Later, in the Autumn of 1939, it moved to Chard in Somerset for training and mobilisation. Considerable changes in personnel took place during this period and in January 1940 Lieut-Colonel R.L. Travers, O.B.E., R.A. assumed command. Early in April 1940 the Regiment joined the B.E.F in France and was stationed on the Belgian frontier near Bailleul. When Germany invaded the Low Countries the Division, which was part of 3rd Corps, advanced into Belgium and the Regiment was given the task of providing A.A. protection to units of the Corps during the move. The Division then took up defensive positions along the River Escaut with its left flank at Oudenarde. The Belgian Army was on the left and part of 1st Corps on the right and through these positions the remainder of 1st Corps withdrew. The Regiment, which was fully deployed, suffered considerable casualties and losses in guns in the five day battle which developed, though these were caused primarily by gun positions being over-run by German infantry, as no German tanks were operating on this part of the front. This was the first and last time that the Regiment was employed under Divisional control in this campaign. A general withdrawal then took place to the area of Courtrai and Menin, after which the Regiment was completely split up, 227 and 228 Batteries being sent to an Independent Brigade in the Hazebrouck – Morbeque area, 225 Battery to Macforce in the Bethune area, and RHQ and 226 Battery with the Division in the Merville – Sailly area. During the very confused fighting which followed, and with the Batteries spread over the Southern and Western front of the ring surrounding Dunkirk, German tanks were engaged, notably in frustrating an attack on Hazebrouck in which three enemy tanks were claimed by 228 Battery. Three others are believed to have been destroyed in the Merville area, but the bulk of the Regiment’s fighting throughout the campaign took place against German infantry and aircraft and the 2 pdr was used with some effect on several occasions against the former at close quarters. On May 29th orders were issued to withdraw to Dunkirk. By this time 75% of the guns in the Regiment had been destroyed or lost by enemy action and the remainder, together with other equipment, were ordered to be disabled during the final stages of the withdrawal. Evacuation proceeded over subsequent days from Dunkirk, but the general confusion resulted in the unit being completely dispersed. By mid-June the Regiment began to re-assemble at Oxford and in July 1940 moved with the 44th Division to the Doncaster area in Yorkshire, under 1st Corps. Seven officers out of a strength of 21 and approximately 160 other ranks had been casualties in France. After intensive training and partial re-equipment the Regiment moved in September 1940 to the invasion coast in the South and was deployed from Newhaven to Romney Marshes. At this time a further change in commanding officers took place and Lieut-Colonel G.P. Chapman, D.S.O., M.C., R.A. assumed command. In early 1941 the Division came under 12 Corps in S.E. Command and remained on the Kentish coast from Dover to Whitstable until it moved to the Wimbledon area in March 1942 for mobilization. During this period a great variety of equipment was handled by the Regiment, including 2 pdrs, 6 pdrs (1916 pattern), American 75 mm and 4” Naval coast defence guns. In September 1941 the whole of RHQ and one Battery (228) were taken away to form the nucleus of a new Anti-Tank Regiment (the 82nd, which has served in India and Burma) and an entirely fresh RHQ and Battery (300) were formed to replace them. It was at this time that Lieut-Colonel J. Anderson Smith, R.A. assumed command. Substantial changes in personnel took place throughout this period. The Division was embarked for service in the Middle East in May 1942, the Regiment at that time being equipped with three 2 pdr Troops and one 6 pdr Troop per Battery, and in early August, having disembarked a fortnight previously, came under command of Eighth Army. It was immediately moved into the desert to form a defensive Southern flank to the main Alamein positions and was heavily engaged in the Battle of Egypt which developed in late August and early September during which 300 Battery claimed three enemy tanks. From then onwards the Regiment was continuously in action until the end of the North African campaign. In September the Division took over the New Zealand Box and was heavily engaged in the Battle of El Munassib, in which 226 Battery was involved, and which preceded the Battle of Alamein. The Regiment received 32 x 6 pdr guns on the afternoon before the latter. At Alamein the Division was employed in the extreme South with the 7th Armoured Division and when the latter moved North for the final breakthrough and follow up, 225 and 226 Batteries moved with it as part of 131 Infantry Brigade – of the 44th Division – which later became the Lorried Infantry Brigade of the 7th Armoured Division. After the battle the 44th Division was broken up and the Regiment became Eighth Army Troops. From El Alamein to Tobruk 225 and 226 Batteries operated temporarily with 10 Corps. The rest of the Regiment advanced from Alamein to Medenine across the Tunisian Border with 30 Corps. 225 and 226 Batteries rejoined the Regiment at El Adem. Batteries were deployed with 7th Armoured Division, 8th Armoured Brigade and the Highland Division, taking part in every action, including Mersa Brega, Marble Arch, Beurat, and the victorious entry into Tripoli at the end of January 1943. At Marble Arch the balance of 16 x 6 pdrs was received. After the battle of Medenine on March 6/7th 1943, RHQ, 225, 227 and 300 Batteries were employed with the New Zealand Corps for the left hook round Mareth and subsequently with it through the battle of Wadi Akarit up to Enfidaville. 300 Battery became detached and served with the French ‘L’ Force with which they were engaged in the actions at El Outid and El Graa which preceded the advance of the Corps to El Hamma, and after Wadi Akarit with 10 Corps HQ. The fourth battery (226), which received four 17 pdrs on 12th March, had come under 50th Division for the Battle of Mareth during the course of which the 17 pdrs were used to destroy a group of fortified enemy M.G. posts. For the advance to Wadi Akarit 226 Battery was attached to 201 (Guards) Brigade with which it remained until the end of the Tunis Campaign. As a result of re-organisation in the Army after the Battle of Akarit, the Regiment became the official 10 Corps Anti-Tank Regiment. RHQ, 225 and 227 Batteries at Enfidaville left the New Zealanders when the latter returned to Cairo, and came under command of 201 (Guards) Brigade with 226 Battery. The fourth Battery (300) was then sent back to the Delta to form an Independent Battery in support of the Malta Brigade for the invasion of Sicily. The Battery subsequently became airborne and with the 2nd Parachute Brigade took part in the landings in the South of France and Greece. It ceased to be a component of this Regiment. When the Guards Brigade moved with the 7th Armoured Division and 4th Indian Division for the final breakthrough to Tunis, 226 Battery went with them and the remainder of the Regiment stayed in the Enfidaville area, serving under 56th Division, 51st Highland Division and finally the 1st Free French Division in turn. After the campaign the Regiment moved back to Tripoli where 192 Battery was formed to replace 300. Total casualties throughout the campaign were 4 officers (1 killed) and 95 Other Ranks (46 killed). In September 1943, E Troop of 226 Battery joined the Special Service Brigade, composed of Nos 2 and 41 Commandos, which took part in the initial landings at Salerno. This Troop subsequently rejoined the Regiment on October 23rd having, in the meantime, operated under 46th Division with which it served until the River Volturno was reached. On October 8th 1943 the Regiment (less E Troop) joined CMF as part of the Fifth Army and disembarked at Salerno. It remained concentrated first at Castellammare and then the Aversa area until November 11th when it came under command of 23rd Armoured Brigade as infantry in the Rocamonfina area. In this period 192 Battery had been employed as infantry under 56th Division at Formicola, but had returned after nine days. One Troop also had been detached for duty at 10 Corps P.O.W. Cage. The Regiment, still as infantry, moved with 23rd Armoured Brigade to the Garigliano front during the early part of December and remained there until 18th December when it was withdrawn to Corps command. On the 12th January 1944 227 Battery, which had in the meantime been equipped and trained with 4.2″ mortars, came under command of 201 (Guards) Brigade for the assault across the River Garigliano, and advanced to the Trimonsuoli-Tufo area in which it remained with two short reliefs until the night 7/8th March. On the 13th January 1944 the remaining resources of the Regiment were placed under command of 56th Division for porterage duties across the River Garigliano. 192 Battery was withdrawn on the 30th January, reformed into an Anti-Tank Battery, and sent to the Anzio Beach-head. This Battery served under the 1st, 56th and 5th Divisions and the 36th U.S. Combat Engineers. It claimed three enemy tanks and a number of enemy infantry engaged by small arms fire. During the various actions which took place in the beach-head both 6 and 17 pdrs were used against enemy strong points. The remaining porterage parties were withdrawn on the 14th February and formed into a composite Infantry Company which a week later occupied positions on Mt Damiano. In March 1944, 225 and 226 Batteries began re-equipping with 3″ M10s and in early April 227 Battery, still armed with their 6 x 4.2″ mortars, were withdrawn to rest. After a few weeks in the Villa Literno area the Regiment was ordered to move to San Massimo near Boiano on the East front, as 10 Corps were being returned to Eighth Army. Shortly after arriving, 227 Battery again went into action with the mortars under command of 2nd Parachute Brigade in the mountainous area of Mt Cairo to Mt Maio. In the meantime very intensive training was carried out by the S. P. Batteries which by now had received their full scale of 12 x M10s each. In the course of this training 226 Battery went into action in the area of Vasto Girado and fired concentrations in support of 24 (Guards) Brigade during diversionary attacks which were being made to deceive the enemy just before the main battle opened in May 1944. As the main battle moved forward, the Regiment stayed behind in the Carovilli area and continued its intensive training. At last came the news of the link up with the Anzio beach-head forces and land communication was established with 192 Battery, which had remained there throughout the period. At the close of the battle the Battery was concentrated just South of Rome. In June the Regiment was ordered to rejoin 10 Corps who were by this time operating North of Perugia. 192 Battery also rejoined and the whole Regiment in the area South of Perugia was, for the first time for months, concentrated. Intensive training continued and was completed by a visit of the Corps Commander to inspect a demonstration exercise. In the meantime 227 Battery also started preliminary training with the M10 and, in conjunction with 192 Battery, were still supplying guards for the 10 Corps P.O.W. Cage. At the end of June 225 Battery was ordered into action in support of a force consisting of the K.D.Gs. and supporting arms and commanded by Colonel Stopford-Sackville of the 9th Armoured Brigade. At this time Lieut-Colonel J. Anderson Smith, R. A., having completed his period of command, left and Lieut-Colonel D. Swinburne of the R.U.R. assumed command. 192 Battery was then ordered to send the balance of its personnel, after assuming full responsibility for the Cage, to do traffic control with the C.M.P. 226 Battery were also ordered into action in support of the 10th Indian Division who were advancing in the Area Umbertide – Città di Castello. 225 Battery in the meantime had advanced to Arezzo, which they occupied close on the heels of the forward infantry, and RHQ moved to Cortona. Both S.P. Batteries were employed primarily in the field role but each used troops in the ground anti-tank role. North of Arezzo occurred the Regiment’s only S.P. casualty one of 225’s being knocked out and finally completely brewed up by enemy anti-tank action when engaged on a patrol with the K.D.Gs. Meanwhile 226 Battery had engaged enemy strong points with direct fire and had succeeded in destroying an enemy armoured car at long range – continuing throughout the field role with two or more troops involved. North of the line Città di Castello – Arezzo both S. P. Batteries continued in the field role in support of the 10th Indian Division and 9th Armoured Brigade in turn. 226 Battery worked East of Città di Castello in the general area of Apecchio and St Angelo in Vado, finally finishing up at M. Carpegna. It is believed that their guns were the first in this sector to shell the Gothic Line proper. 225 Battery operated in the Montone area finally finishing up near Leverna Monastery. In the meantime 192 Battery had continued with their police and guard duties – RHQ had moved to Monsoglio, N. W. of Arezzo and 227 Battery, now deprived of their mortars, were training hard on M10s South of Città di Castello. In September the whole Regiment was ordered to concentrate for re-fit etc. North of Arezzo preparatory to a move forward through the Gothic Line which, by now, had been breached on one front. 192 Battery were removed from traffic control and ordered to supply a party of sixty men for assisting the Sappers in dismantling and re-erecting Bailey Bridges and general maintenance of communications North. RHQ, anticipating a forward move of the S.P. Batteries into action, moved to Badia di Prataglia, but returned North of Arezzo after a week when the forward moves were cancelled. The Regiment was then ordered to provide twenty three tonners and personnel for general duties in transportation, and the necessary officers and staff personnel with wireless sets and equipment to man two traffic control posts. All this was to assist the move forward of the Polish Corps who were relieving 10 Corps. In October all duties finished and the Regiment concentrated South or Perugia in the same general area as it had been occupying in June. Here, in addition to providing several transport and man power fatigues for the Corps, an Anti-Tank Range was constructed for general use. The Regiment moved from the Perugia area to Tolentino in December 1944 and remained there until the end of March 1945. It was, in the main, a period of rest but during the latter half a complete re-organization and consequent training were carried out. The former involved the disbandment of 227 Battery which, by now, had become fully trained on S.Ps and the incorporation of 316 Battery (ex 105th Anti-Tank Regiment, R.A.) into the Regiment. 226 Battery sent an S.P. Troop of 17 pdr M10s to 192 and 316 Batteries each and in their place received a towed 6 pdr Troop from 316 and a towed 17 pdr Troop from 192. The results of this re-organization were that 226, 192 and 316 Batteries became equipped with an S.P. troop – the first two Batteries with 17 pdrs M10 and 316 Battery with 3″ M10 – a towed 17 pdr and a towed 6 pdr troop each. The fourth Battery, 225, remained with 12 x 3″ M10s as the only wholly S.P. Battery in the Regiment. The three Troops of 227 Battery were sent on the 10th April to R.A.T.D. in transit, with a view to joining later the 149th Anti-Tank Regiment, R. A. This did not in fact take place but at the time of writing it is expected that they will be re-absorbed into the Regiment. Fortunately it was found possible to absorb into the 57th a large proportion of the personnel of the disbanded 227 BHQ. Towards the end of March 1945 the Regiment moved by stages into action once more. 225 Battery joined the 8th Indian Division with 5 Corps and the remainder came under 10 Corps in the Faenza area. When the final Battle of the Italian campaign began on the 9th April 1945 the Regiment was deployed as follows. The Regiment, less 225 (S.P.) Battery, was under command of 10 Corps in the area Faenza – Brisighella. 225 Battery under 5 Corps, was supporting 8th Indian Division in the area of Bagnacavallo. To avoid confusion the activities of this Battery will be given separately. The three mixed Batteries with the Regiment had only their S.P. Troops deployed in action. Two (both S.P. 17 pdrs) were in the normal anti-tank role in support of the Jewish Brigade and Friuli Gruppo respectively and the third (S.P. 3″) was acting in the field role under the 2nd R.H.A. in support of the Italians. This last Troop (N /316 Bty) did not, in fact, move from its position behind Brisighella throughout the operations but during the early stages engaged successfully a series of targets ranging from enemy O.Ps and M.G. posts to harassing shoots on roads and likely avenues of withdrawal and approach. It fired a total of 951 rounds of H.E. and later checks showed good results. Once the battle moved beyond the limit of gun range this Troop dropped out. The two S.P. 17 pdr Troops (K/192 Bty and G/226 Bty) were linked to the Air O.P. Both Troops were sited to cover the crossings of the Senio undertaken by the Jewish Brigade and Friuli Gruppo. In the case of G Troop the extremely exposed nature of the ground near the Senio necessitated the guns taking up indirect fire positions. K Troop was fortunate in having a ridge of hills which provided excellent hulIdown positions and from which the ground across the Senio could be covered by direct fire. In fact both Troops were asked to demolish certain enemy strong points. G Troop, firing indirect, scored 14 hits out of 23 rounds fired at 3500 – 4000 yards of range. K Troop by direct fire hit the target (a small house) with 17 rounds out of 21 at approximately 3000 yards. This last shoot was carried out at dusk the layer had difficulty in seeing clearly the markings in the telescope. As a result one round of H.E. was fired at a hay stack close to the house and up wind of it. This set the stack on fire and the layer was in consequence able to see the telescope markings clearly against the background of flames which blew across the target itself. After the Senio had been crossed on this front the Jewish Brigade fell out and with it K Troop. G Troop, however, advanced in support of the Friuli Gruppo to within five miles of Bologna when it was withdrawn to 226 Battery. At the outset of the battle 316 Battery had sent L Troop (17 pdr towed) to guard the 10 Corps P.O.W. Cage and on the 20th April M Troop (6 pdr towed) came under command of 5 Corps. This Troop formed part of a special force under 22 AGRE which was detailed to shoot up any objects floating down the Po and Adige rivers and which might have caused damage to the bridges etc., under construction. It fired 6 pdr and hundreds of rounds of S.A. ammunition at a variety of targets from barges to dead horses. On the 18th April 1945 192 (Mixed) Battery came under command of 13 Corps and, having collected K Troop (S.P. 17 pdrs), moved to area Medicina in support of 43 Indian Lorried Infantry Brigade under the 2nd New Zealand Division. This Battery advanced with the same Brigade right up to the Isonzo area near Trieste where it was detailed to guard various V.Ps during the period of tension. Although deploying on several occasions it only once went into action proper. This was near Padua on the 29th April when J Troop, who were the first troops to enter one of the suburbs, collected 14 P.O.W. On the 21st June 192 Battery rejoined the Regiment. RHQ during the battle moved from Faenza to Imola and commanded, therefore, three, two and two Batteries less one troop successively, whilst the Regiment as a whole was deployed ultimately over the three British Corps. 225 (S.P. 3″) Battery supported the 8th Indian Division in the initial crossings of the Senio. Two Troops were across within the first three hours and the third by daybreak. Owing to the destruction by enemy fire of one of the cable ways B Troop towed 4 x 6 pdrs of the infantry across the Ark laid over the river. This, unfortunately, caused a delay which resulted in a small group of enemy tanks escaping before B Troop could arrive on the scene and no further tanks were sighted during this phase of the battle. However, D Troop destroyed several enemy strong points by direct fire. Two S.Ps of this Troop had a narrow escape. They were returning from a screen put out in conjunction with 6th Lancers when an enemy anti-tank gun opened fire. The rounds missed and a few moments later the same gun missed a Sherman tank before being over-run by our Infantry. On the 13th April 8th Indian Division were relieved for a rest but on the 20th April the Battery was back in action supporting the advance of the Division to Ferrara. It was during this attack that B Troop destroyed an enemy Mk IV tank which was sited behind a house. G Troop also engaged a building in Stienta with direct fire. This, having had about 100 rounds of H. E. fired at it, collapsed completely. On the 29th April 225 Battery, with the Division, fell out of the battle having reached the general area between the Po and Adige rivers, and concentrated at Villa Marzana. It subsequently rejoined the Regiment. At the time of writing the whole Regiment is concentrated in the Cattolica area near Rimini under 2 A.G.R.A. A variety of tasks is being performed of which the main one is that of guarding some or the many thousands of POWs which this campaign has finally yielded. Casualties over the entire Italian campaign amount to 84 which are made up as follows. Officers, 2 killed, 4 wounded and 1 missing; O.Rs, 15 killed, 58 wounded and 4 missing. This, therefore, constitutes a brief record of the War History of the 57th (East Surrey) Anti-Tank Regiment, R.A. Throughout the whole period of the war honours awarded to personnel of the Regiment include to date 1 D.S.O., 11 M.Cs, 12 M.Ms, 1 B.E.M., and 28 mentions in despatches. No less than 27 different formations from Independent Brigades to Divisional level have been supported during the war and service given under 5 different Armies and 9 different Corps in three different theatres of operations not including the invasion period at home. France, Belgium, the invasion coast of S.E. England, Egypt, Cyrenaica, Tripolitania, Tunisia and Italy have been the battle grounds on which the Regiment has served and it has worked actively with United Kingdom, New Zealand, Indian, American, Polish, French, Greek, Belgian, Palestinian and Italian troops.